The grey coat on my Butcher of Khadov shown underneath was painted to appear somewhat weather-beaten while at the same time looking like a classic uniform. Basecolour of Codex Grey; shading with a slightly thinned Schorched Brown with a drop of Purple ink; and highlights adding Bleached Bone to Codex Grey. The Gold details were painted Shinning Gold followed by a highlight with Burnished Gold. Finally, the coat was glazed very carefully in specific places such as around the rivets and towards the fur areas using thinned down Schorched Brown. 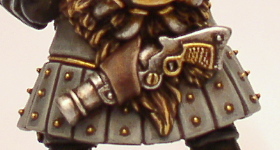 Another very similar variation of painting grey cloth shown with step-by-step pictures was used to paint a chaos warrior cape.